This is the quilt top I've been working on. The middle is a panel. I have added two borders - thin pink inner border and thick purple outer border. I also added some patchwork appliques. The batting and backing will be a lightweight flannel. I am trying to figure out how to actually quilt this. What sort of design to use? It cannot have curves as my skills are nowhere near curves. My first thought was sort of a chevron pattern with diagonal lines in one direction on one stripe and then change directions on the next. That might be ok BUT the green stripes are much narrower than the yellow stripes. I think your chevron idea would work. Just make skinnier/narrower ones on the green stripes and fatter/wider ones on the yellow stripes. Cute quilt. You could use a walking foot to make gently curving lines. They do *not* have to be perfectly matched curving lines! This is a very modern quilting technique that would be suitable for your quilt. It's like sewing straight lines with a walking foot except you manipulate the sandwich gently from side to side as you sew. Since you don't do my favorite - FMQ. Then I would do straight lines a 1/4" from the seams. 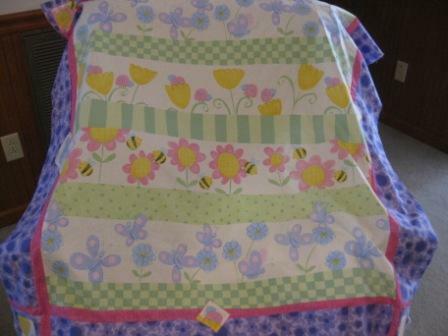 I would outline stitch around the flowers and the stripes and the checks. Then do a chevron in the polka dot piece. Stitch in the ditch around the pink border and another chevron on the outer purple border. I know you said you didn't want curves but you don't have to make up a pattern - just outline the flowers with stitches. Even if it isn't perfect no one will notice when it is all done.